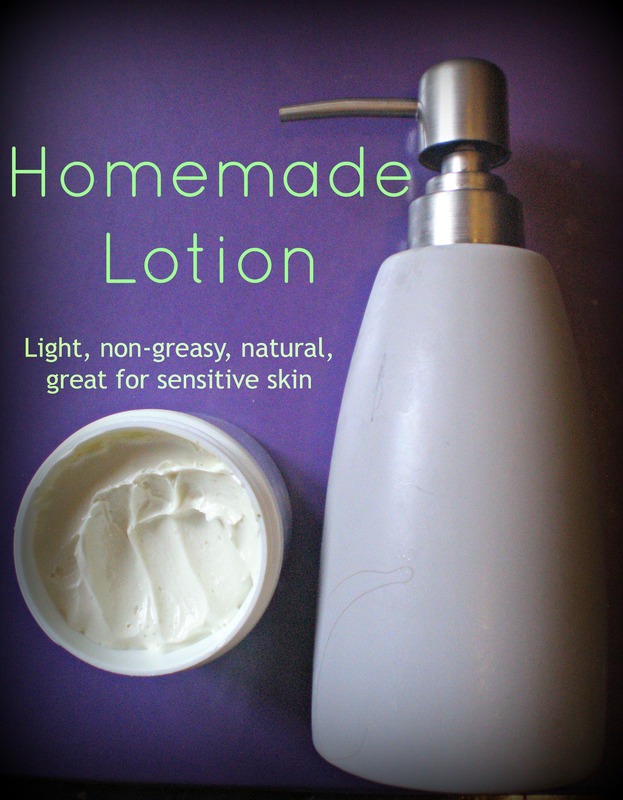 This summer I finally made a homemade lotion that I absolutely loved. It took long enough! I still really like the body butter I’ve made, and either that or just straight shea butter are great for spot treating or intensive treatment of my eczema, as well as for face cream. But for a whole body lotion, something lighter, less greasy, and more readily absorbed is necessary. My Healthy Green Family has exactly what I was looking for! She has a basic lotion recipe that is very easy to make. Accompanying this recipe is an extensive explanation of why homemade lotion is the way to go and discusses some chemicals you will want to avoid. I highly recommend reading it! In addition to the basic recipe, there are also recipes for certain purposes, like sunscreen or anti-aging. I made her chamomile-infused lotion, as the ingredients are very good for sensitive and damaged skin. This lotion was easy to make up. It took time, as the water and oil need to properly emulsify. Having a partner to pour while your use the immersion blender is helpful, too. But I made a large batch that promises to last quite awhile (stored in the fridge, in a separate container from the one that I use daily, to prevent bacterial growth). The little bit of work was definitely worth it (and I even infused the oil with chamomile myself!). This lotion is light and smooth. I used grapeseed oil, so it absorbs readily into my skin and is non-greasy. Yet my skin is smooth and moisturized, and I am very happy with how it has been working. It does not cut through my eczema; I need the shea butter for that. However, for everyday moisturizing, it is perfect and stretches my lotion budget (which, to be honest, the shea butter didn’t). Looking for more? Learn to make your own products with DIY Organic Beauty Recipes! Want homemade quality lotion without the work? Check out Pronounce Skincare. Handmade lotion is the best!